Holiday travel has reached a level of tremendous significance world-wide as an economic factor. Holidaymakers have an enormous choice of how to spend the best days of the year. Even though 11 September 2001 and he financial and economic crisis period of 2008/2009 caused major turbulence in the tourism sector and has led to long-term change, the love for travelling in industrialised countries remains intact. Over the last 20 years, a special type of holiday has proven to be particularly booming, crisis-resistant and innovative: the cruise. The rates of growth in this sector, with a global annual turnover of almost 20 billion Euros, still shows potential for expansion over the next years. About 350 ocean cruise ships sail the oceans. Some offer space for 200 passengers, others for 6000. Some ships carry mountain bikes, ice rinks and climbing walls, others tempt their clients with art collections, library and planetarium. The time has passed when cruises were just something for a mature and particularly wealthy audience. Shipping companies have discovered younger people as an important target group and developed suitable concepts accordingly. Thanks to shorter travel times, larger ships and more intense competition, prices keep falling, making this type of holiday more and more affordable. Thus, some 18 million ocean cruise holidays are taken each year. The sector is dominated by large American companies. With a global market share of over 50% and such well-known brands as Aida, Carnival, Costa, Cunard or Princess, the Carnival Corporation sets the tone, followed by Royal Caribbean Cruise Line with about 25% market share. However, there is also a large number of smaller operators in the market with their own clear style and distinctive features. In addition, there are the numerous operators of river cruises, passenger ferries, mega yachts and cargo ships with passenger cabins. 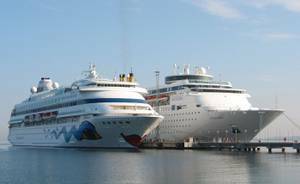 The cruise sector is part of a complex network of suppliers and distribution partners which stretches round the entire world: shipyards, ports and terminals, fuel and food suppliers, waste disposal firms, personnel services, security firms, airlines and hotel companies, incoming agencies, travel companies, travel agents and many others. For cruises to be exciting, eventful, relaxing and at the same time affordable for the passengers but still profitable for the suppliers, a lot of hard work must be done behind the scenes, both on board and ashore, even if it may not appear so from the outside. A wide variety of aspects come together in the preparation and operation of cruises: economics, transportation, hospitality, entertainment, technology, logistics, navigation, safety, environmental protection, languages, cultures – and above all people. All these aspects must be planned, steered and monitored or at least taken into consideration and integrated. This is referred to as “management”. Since October 2003, a unique Bachelor programme aiming at preparing students for business and management tasks in the cruise tourism sector can be studied at the Hochschule Bremerhaven: Cruise Tourism Management (CTM), previously known as (International) Cruise Industry Management.